With a body-coloured pop-up aluminium roof, a two-seat rear folding bench which converts into a two-person lower bed plus loads of room up front and space to spare for luggage in the back, the flexible California Beach is holiday-ready. Below, there’s everything you need for a great camper van holiday. 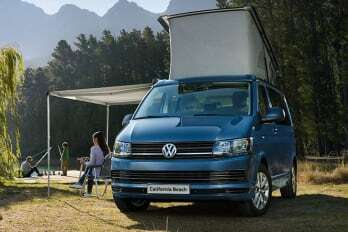 A lower bed with sleeping mat and storage compartment, fabric black-out blinds for a great night’s sleep, a folding table which attaches effortlessly to the sliding door, two folding chairs - stored neatly in the tailgate, and a second 12v battery. The California Ocean offers that little bit more luxury you deserve such as climatronic three-zone automatic air conditioning, luxury cut pile floor mats and sliding side windows with fly screens. Two maintenance free auxiliary batteries with cut-off relay for power the living area. Wherever you’re going, the California Ocean has real power and performance. Choose from the 150ps 2.0 TDI or 204PS 2.0BiTDI, both available in 6-speed manual or 7-speed, dual-clutch, direct-shift gearbox. Wherever you’re travelling, the California Beach has an engine to perform. Choose from the 102ps or 150ps variants of the 2.0 TDI, with the latter available in a 7-speed, dual-clutch, direct-shift gearbox to give you real power and performance. The California marries practicality with safety and style throughout. The sliding floor rail system makes set-up simple and with plastic entrance step and tailgate sill protection and step illumination with California logo for cab doors and side sliding door, the California is accessible in the dark as it is in daytime. The two-seat rear bench also accommodates ISOFIX child seat mountings and a storage box to its left, plus there’s a 230v supply for re-charging vehicle batteries. As always from Volkswagen safety is a top priority. The Ocean is designed to drive like a car, with agile handling, real stability and easy manoeuvrability. Standard safety specification includes ABS, electronic brake-force distribution, electronic stabilisation programme, traction control plus passenger and driver side and front curtain airbags. 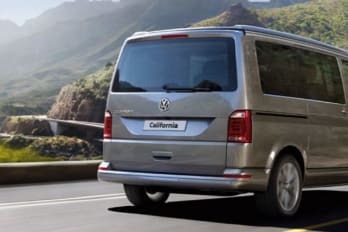 Representative example for California Beach 2.0 TDI 150PS BMT DSG subject to a 36 month, 10,000 mile per annum agreement. Drive, eat and sleep in comfort. 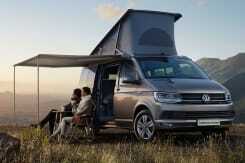 The Volkswagen California Beach.